Regular waffle makers tend to be what people picture when they first think of making waffles. A small appliance that sits on the counter with a lid that opens and closes- simple as that. Using a standard waffle maker is pretty straightforward as well. You heat the waffle maker, lift the top, pour in the batter and close the top. Once the waffles are cooked, you lift the lid and eat your waffles! Pretty easy. One of the biggest problems with a standard waffle maker is that they tend to cook waffles unevenly. When you pour the waffle batter on to the bottom plates of the waffle maker, the batter immediately begins to cook which makes the underside of the waffles more brown than the top. Once you close the standard waffle maker, the waffle batter doesn’t always touch the top (especially if the waffles fail to rise due to insufficient baking powder). If the batter isn’t touching the top plates, this will also cause the waffles to remain pale throughout cooking. The result can be a waffle that is dark and crispy on the bottom, light and chewy on the top. Of course, this isn’t the case with all standard waffle makers. There are many great traditional waffle maker options like the Krups 4 Slice or the cool Texas Shaped waffle maker. Having a great waffle batter will also help make traditional waffle makers create nice looking waffles. But there is also another way…. Flip waffle makers do just as their name implies- flip over. Flip waffle makers are typically raised off of the counter and have a handle that you twist to spin the waffle maker, flipping it 180 degrees. (Need a visual demo? Watch our video review for the Oster DuraCeramic Flip Waffle Maker). The waffle maker lid opens, batter goes in, the lid closes and then you rotate the waffle maker using the handle. Why Would The Flip Be Helpful? By flipping the waffle maker upside down, you are using gravity to let the batter settle into the waffle maker plates on the top of the machine. Like we explained before, when you pour the batter into the waffle maker, it immediately begins to cook on the bottom plates. When you flip the waffle maker over, the batter then pours into the top plates and cooks quickly as well. This makes both sides of the waffle brown evenly. Thanks gravity! When comparing the two types of waffle makers, flip waffle makers tend to come out on top as the better option. As a whole, they cook more evenly and make waffles that are crispy on the outside but still fluffy in the middle. Our absolute favorite flip waffle maker is the Presto FlipSide Belgian Waffle Maker which actually sits on the counter- a rarity for a flip waffle maker. However, there are times when a standard waffle maker would be preferable. If you need to cook multiple waffles at once, a standard waffle maker is the way to go. A nice, big waffle maker that cooks four waffles at a time isn’t going to be available with a flip function (check out the Hamilton Beach 4 Slice!)! Flip waffle makers can also be slightly bulky and hard to store– standard waffle makers are great for tiny kitchens. Depending on your waffle needs and preferences will help determine if a flip waffle maker is best for you when compared to a standard waffle maker. 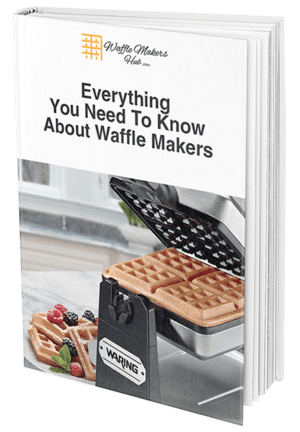 Our Ultimate Buying Guide will help you look more closely at a wide variety of waffle makers and our blog about things to consider when buying a waffle maker will guide you toward your perfect machine. However, when looking at standard waffle makers vs. flip waffle makers in general, we like a good flip!